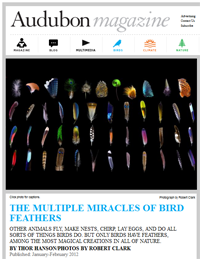 The feathers showcased in the photo accompany a recent essay in Audubon Magazine (screenshot above) are breathtaking to look at. But how safe are feathers to pick up? We're out for a rare walk around one of my favorite spots in the Bay Area, Stow Lake in Golden Gate Park. We've fed the geese and practiced our aim as we tried to toss bits of salvaged and saved bread to them and the mallards. We know the gulls will swoop in, loudmouthed and pushy, to steal away our stale but doughy offerings. My youngest has greeted his "friends," the gray coots with their white-spotted foreheads, red eyes, and chartreuse feet. We've stopped and peered up into the trees where the great blue herons nest in the spring months, though we know that despite the weather, it is too early for them. We've shooed away the flock of pigeons that has crowded around in hopes of sharing our bag of bread. The bags all emptied out, we're heading around the perimeter of the lake, a path that will take us past a small tunnel made of branches and twigs that they can just barely crawl through, across a bridge (see the keystone? ), along the lower level of the tiered paths that wind around the small mountain to a beautify city lookout at the top, past the Japanese pagoda and the waterfall, around the boathouse (which no longer sells ice cream treats), and back to the car. They run ahead, footsteps kicking up dry dirt and rock as they move along the path, pausing now and again to peer at a treasure on the ground, a shiny rock ("a crystal"), a perfect stick, a dandelion, a squirrel jumping away with a foraged scrap, a Steller's jay that has jumped from the ground to a branch above with a loud squawk. They run ahead as I take photos from behind, of them, of branches, of light on the water. I remember when feathers could be picked up, when feathers were magical and marvelous, when you could run your finger along the edge of a feather and be amazed by the softness. I remember the impossible discovery of a peacock feather. Many years have intervened between then and now. Many years, two children, and a host of frightening flus that have lingered in public—and parental—consciousness. The residue of those years and those flus has accumulated into a frothy, sticky, mostly unfounded, squeamish sign of my age, one that comes oozing over the sides of the admonishment: "Don't pick that up. It's dirty!" Needless to say, while we have small collections of rocks, broken shells, shark's teeth, and other treasure we've accumulated through various walks and expeditions, there are no feather collections in our house. Not even one. All of that came rushing home when I saw a photo by Robert Clark highlighting a feature essay by Thor Hanson in Audubon Magazine. The photo is an 'almost' grid of forty-seven feathers, brightly colored, samples of bird plumage from species of birds I've no doubt never seen. These are not your ordinary, everyday pigeon feathers, the ones I am most tempted to disallow my kids pick up and handle. These are feathers that remind us of the beauty and wonder of birds, the exotic free-flying nature of birds, and the sheer diversity of birds. But this is a reminder from a new angle. Feathers. The photo is a stunning visual entrÃ©e into an equally captivating essay underscoring the beauty, novelty, and incomparable nature of features. No matter what your relationship with birds, or whether or not you would or would not have picked up (or let your children pick up) a feather on the street yesterday, Hanson's high-flying essay on feathers may sweep you away. Hanson's essay weaves together the scientific and the aesthetic, the personal and the historic, the pragmatic and the mystical, and emerges as a beautiful and inspiring exposÃ© on feathers, a distinguishing feature of birds, one that is unique to birds, one at which you may not have stopped before to marvel or think about too deeply. After reading this essay, I think you will. I think you'll pick up a favorite blanket or winter vest and think differently about the realities of feathers. You might even look up a photo of a golden-crowned kinglet so that you can have an image to pair with Hanson's story of a night spent in sub-zero weather—and the realities of the small golden-crowned kinglet sleeping somewhere in the open air, relying on its feathers alone for warmth. Hanson's essay is thought-provoking and eye-opening, and for students with an interest in birds, or even an interest in paleontology, there is plenty of potential for inspiring and inspired science projects that may find a launching point in an essay on feathers. One path students might follow involves considering the question: where did feathers come from? And why do birds, alone, have them? A project looking at the history of feather formation will take students back to the age of dinosaurs. That's right, scientists now label birds as a living form of dinosaur, a fact students can investigate further in the "BLAST into the Past to Identify T. Rex's Closest Living Relative" genomics Project Idea. After reading "The Multiple Miracles of Bird Feathers," I found myself wondering about the weight of "don't touch that" fear I've somehow picked up along the way, part of the baggage of socially-induced paranoia that many parents carry around, especially when and if we are too busy to stop, question, and get the facts. If faced with the kinds of delicate, diverse, exotic, breathtaking, and mesmerizing feathers shown in the Clark's photo, I doubt I could insist we leave the feather where it lay. That's why we carry anti-bacterial hand gel, right? But can I let go of my concern about the ordinary feathers we're more likely to discover in our regular outdoor excursions? After all, while there is a wonderful plethora of natural terrain in and around the Bay Area, we're still in a city. Hawks perch on the streetlights in front of my house and nest in the trees out back, but there are also thousands upon thousands of pigeons and starlings and blackbirds, even in the parking lots of the grocery stores. Our lead staff scientist confirmed that while it's "possible" to get a disease from bird feathers, the probability is very slim. Still, there is a question that can be asked, and so there are projects that can be designed and procedures that can be put in place to explore how "safe" found feathers might be. Is a parent who says, "Don't touch!" right—or just over-protective? There are three kinds of health hazards that can be carried on a feather: parasites, bacteria, and viruses. Of the three classes of possible health problems one might trace back to feathers, culturing bacteria from feathers and analyzing the bacteria colonies that grow is the most likely course of investigation for student research. Students interested in developing an experimental procedure that could be used for a microbiology-based study of feathers might find the procedure used in the Germ Invasion Project Idea a helpful starting point. Is exposure to UV light a helpful strategy? Because there are many rules, regulations, and safety guidelines that have to be followed for student science investigations that deal with microorganisms, devising an independent course of study examining microorganisms and feathers requires careful attention to safety guidelines, awareness of any local fair rules, as well as ISEF regulations, and may require the supervision of a teacher or mentor or access to a specific kind of lab. In addition, your project may require pre-approval from fair officials. For more information about safety considerations when working with bacteria, and about related ISEF rules and regulations, visit the Microorganisms Safety Guide and the Projects Involving Potentially Hazardous Biological Agents resource. Science Buddies Genetics and Genomics Project Ideas are sponsored by a generous grant from Life Technologies Foundation. The Germ Invasion Project Idea was developed by Laurie Usinger, Bio-Rad Laboratories. Bio-Rad Laboratories sponsors the Biotechnology Techniques Interest Area at Science Buddies. The 'Pigeon' is a beautiful bird. Pigeons are domestic, stout-bodied birds. They have short necks and short slender bills with a fleshy beak. Pigeons eat seeds, cereals, lettuce, endive, chickweed, clover, watercress, berries, apple, pears, etc. There are many kinds of pigeons. They live in nests and the nests are made of sticks. The nest of a pigeon is usually constructed on covered building ledges. Pigeons build their nest with small twigs. Many people keep them out of fancy. A person who keeps a pigeon is called a pigeon fancier. Some pigeons are trained to carry mails to the inaccessible places.